There’s a hot new male fashion trend, and it has legs. I’m talking about short shorts for guys. And I’m terrified. After decades of baggy shorts (a trend arguably started by the Fab Five Michigan basketball team of 1991), the sartorial pendulum has swung back in the direction of men showing a little thigh. We see this trend manifest in the success of Chubbies, an unabashedly bro-y menswear brand that made its name by relentless marketing their WASP-y, pastel-colored short-shorts to college-aged Chads on Facebook. The company has raised $16 million in venture capital funding, according to TechCrunch. The guy-thigh trend has spread to other popular menswear hubs like J.Crew, Bonobos and Everlane, where summer styles aren’t just limited to a traditional 9- or 10-inch hem. Five-inch and 7-inch lengths are just as common. Leg is in. We see it in the NBA, where LeBron James, the greatest basketball player in the world, has bravely and graciously paved the way for us lesser men to wear shorts with our suits in the summer—shorts that fall just above the knee. In hip-hop, Childish Gambino and Gucci Mane have been spotted rocking short shorts. In Hollywood, consider the 2017 indie darling Call Me by Your Name’s endless shots of Armie Hammer and his comely inner thighs in ’80s short shorts. It’s no wonder: The mainstream and high-end fashion press has been declaring this the era of short shorts for several years now. But I’m here to tell you that this is all a colossal lie. Women don’t like short shorts on men. Or at least the women I encountered on Venice Beach in Los Angeles don’t. Or should I say, they don’t like short shorts on me. 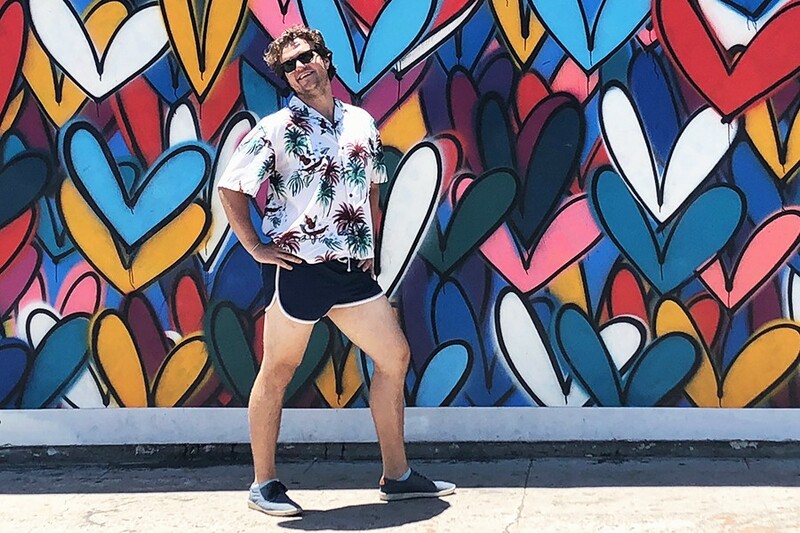 After an initial query to the company Slack about short shorts on guys, I was emboldened by the positive response (“7 inches is too long — I wanna see inner thigh meat,” one said) and ready to try it for myself. But my efforts turned into the ultimate self-own when I spent the better part of Tuesday parading around the neighborhood in the shortest pair of retro-style beach shorts I could find and interviewing women about them. Only one of them had anything remotely nice to say about how I looked. My journey started with a trip to a vintage clothing store a block away from Venice Beach. Finding short shorts was remarkably easy — within 30 second of entering the store, I laid eyes on a pair of navy beach shorts with white trim and a baggy, Hawaiian floral shirt to match. I walked out of the dressing room looking like a divorced ’70s dad who’s looking to get into the swinging scene. Like Harry Crane cruising the pool at the Beverly Hills Hotel when he should be meeting with media buyers. Like Coop from Wet Hot American Summer. I’m so sorry to subject you to this. Immediately, I started taking flak from my personal assistant and MEL colleague Erin Taj, who, when she wasn’t busy pale-shaming me for “pasty leg meat,” took to unashamedly sexually harassing me on the street. It was all downhill from there, however. I thought my fellow Californians would approve of my succulent leg hams. Instead I get ceremoniously dunked on by every woman I stopped to talk to. Sorry, this Instagram wall is for leg influencers only. One man overheard me interviewing women about short shorts and told me I’d look “perfectly fine in the Castro,” San Francisco’s famous gayborhood. Thank you, sir! My first compliment. Only one woman, whose name was Ivory, said she enjoys men in short shorts because it provides her the opportunity to check out their butts, though she didn’t specify she liked mine specifically. And aside from a few lingering stares I received from women, I received no proof that I was pulling this off at all. And who’s to say those stares were even positive? “That girl just looked at you like you were trash,” Taj told me while walking back to the car. The only remotely nice thing a woman said about my short shorts came from a Polish tourist who said they look “good” on me. But I think she was just being polite. Folks, I think we’ve discovered that the short shorts trend is a total sham and should be avoided altogether. Because the only other possible conclusion, that I don’t have good legs, is not really a possibility at all.